Ramallah: Head of Water Authority, Eng. Mazen Ghuneim, met in his office today the Acting Director of the World Bank mission, Anna Bjerde, to discuss issues and programs related to water projects financed by the World Bank. Where Minister Ghuneim reviewed the most important plans that the Water Authority is currently seeking to implement with the aim of rehabilitating and developing water utilities, in order to reduce the water crisis and improvement of service provided in addition to reduce the problems facing the water sector. Noting the achievements of the Water Authority aimed at improving the living conditions of the residents of northern Gaza Strip through the operation of the North Gaza station and the drying of the random wastewater pools north of Beit Lahiya, located adjacent to the Bedouin village, which reflected positively on the environment and the population. 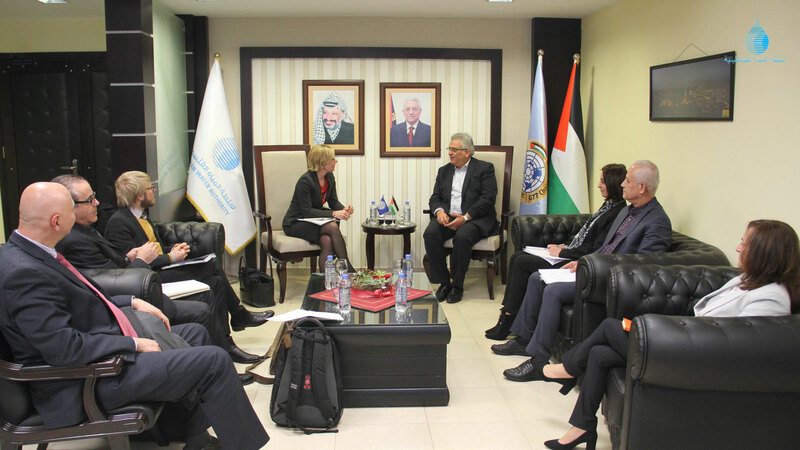 The meeting also discussed the progress of water and sanitation projects such as wastewater treatment plant in northern Gaza, Desalination plants, in addition to water security project in Palestine funded by the World Bank. As Eng. Ghuneim explained in this context, the importance of starting implementation of practical steps to prepare for this program with the emphasis on institutional development of water sectors infrastructure projects such as the development of water distribution network and the mixing tanks in South and central Gaza Strip. At the end of the meeting, the head of the Water Authority, stressed the importance of World Bank to meets their financial obligations towards water and development projects agreed upon to ensure implementation and operation of these projects and ensure its sustainability.